Are you having trouble trying to think of ways to surprise your special girl this Valentine’s Day? Here's our list of 10 romantic gifts that are sure to catch her off guard. Are you looking for a Valentine’s Day gift to surprise your beloved woman and aren't sure where to start? We've got you covered with some suggestions that are sure to make her smile and show her you care. There are many different kinds of gifts to give the number one girl in your life, but here are ten surprise Valentine’s gifts she will love. One of the sweetest and most romantic gestures is to cook a nice dinner for your lady when she least suspects it. Has she been having a stressful time at work? Does she feel like she's always running around without a break? Cook her favorite meal for her on Valentine’s evening, and it will make all the difference. Not only will it be a nice surprise, but it's a great time for the both of you to relax and enjoy some time together. Sometimes helping out with the little things like cooking dinner can mean more than the big things! If you want to plan something special this Valentine’s occasion that will catch your girlfriend off guard, why not schedule a wine tasting tour? While you're at it, why not make it part of a weekend getaway? Hand her a special card on Valentine’s Day evening with a letter inside to explain what she needs to do to prepare for the coming weekend. Wine tasting tours are a fun experience to share together, especially if the both of you love wine. You'll get to try different kinds of wine, but the company, atmosphere, and memories you'll make together are what makes this gift truly special. So go ahead, kick back together with a few or more glasses of wine and have fun while doing it! If you're looking for a surprise gift from left field, planning a helicopter ride will surely do the trick. It's unexpected, and a thrilling experience for the both of you to share together up in the sky. This Valentine’s Day gift is a surefire way to impress her -- as long as your girlfriend isn't afraid of heights, that is! If you're looking for more of a low-key Valentine’s gift to surprise your lady with, a simple night of camping under the stars is the perfect romantic gesture. This is especially a good idea if your partner loves the outdoors, nature, and hiking. Set up your campsite, take a break from work and technology, and enjoy your time together being cozy under the stars. Every girl appreciates being pampered from time to time, which is why a day at the spa is one of the best surprise Valentine’s gifts you can give your girlfriend. A day at the spa is a great way to relax, ease those tense muscles, and practice self-care. Your girlfriend will feel refreshed, recharged, and grateful that you helped give her a day of much-needed relaxation that she deserves. Another cute and unexpected Valentine’s Day gift you can give your woman is setting up a private movie screening of one of her favorite films. It'll show you listen to what she likes and be a truly one-of-a-kind and memorable date. Don't forget the drinks and snacks to complete your unique movie date! If you want to do this at home, make the evening a little more special by making a movie night date crate for the both of you to enjoy together. There's no better feeling than receiving a package in the mail, so why not sign your girlfriend up for a monthly subscription service she'll love? It's the kind of gift that keeps on giving well after Valentine’s Day, and if they are products or items she loves, she'll think about how thoughtful you are every month! Does she enjoy trying new beauty products? Sign her up for Birchbox. Does she love healthy snacks? Buy a subscription to Naturebox for her. What's most important is that you pick something that she will enjoy. Listen closely and do your research to find out what it is that she will be happy to see on her front doorstep each month. Perfume is a classic gift, but it's always a nice surprise to give your girlfriend on Valentine’s Day. It's one of those items that women love, but won't always purchase for themselves. Show your girlfriend you care by splurging on a bottle of her favorite perfume, or one that she's been thinking about getting for a while. 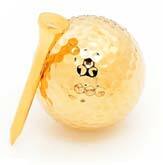 It's a sweet gesture and a gift that lasts a relatively long time too! The best surprise Valentine’s Day gifts are ones that are personalized. If you're looking for a simple gift to put together that will catch your girlfriend off guard, one great idea is to put together a basket of some of her favorite things. These items can range from her favorite snacks, beauty products, or even concert tickets to see her favorite band or musician. Be creative! Taking the time to collect things she loves and give them to her in a bundled package shows that you listen, are considerate, and understand the little things that make her happy. 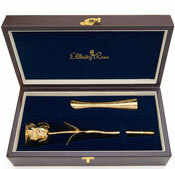 Next to perfume, the other popular and classic Valentine’s Day gift to give your girlfriend is jewelry and flowers. But don’t just opt for regular flowers or roses that will wilt within a few days. 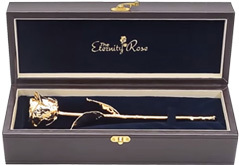 This Valentine’s Day, why not get her an Eternity Rose which is a real rose that has been preserved to last an entire lifetime and beyond? 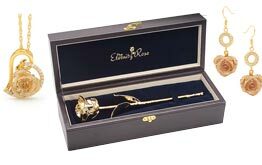 The Eternity Rose range includes roses that have been dipped in pure 24K Gold, platinum or silver, or if you want to go for classic Valentine’s Red, The Eternity Rose has this too and many other colors. 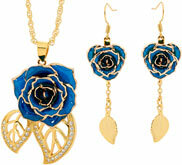 There are also Eternity Rose and Matching Jewlery Sets you can choose from. Your girlfriend is sure to love any of these surprise gifts, and they are guaranteed to put a smile on her face this Valentine’s Day. Whether you're cooking her dinner, planning a special date night or weekend getaway, or give her a series of small things she loves, she'll appreciate that you were thinking of her in both big and small ways. What other surprise gifts do you like to give your girlfriend? Let us know in a comment below!